The collection comes on-loan from the Bodelian Library at Oxford University in England, which since 1610 has received a copy of every book published in the United Kingdom. The collection currently at the Morgan spans both history and the globe. Here are just a few pieces from the “Marks of Genius” exhibit. Although many of William Shakespeare’s plays had been published individually during his lifetime, the First Folio — published seven years after his death in 1623 — marked the first time that a collected edition of his works was printed. Of the 36 plays that were included in the manuscript, half of them had never been in print before. 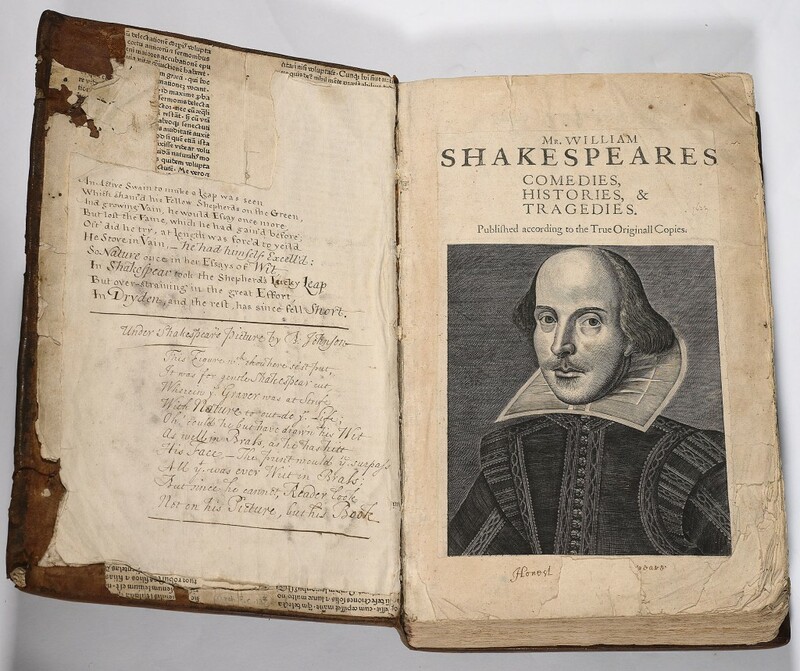 Without the First Folio, it’s very likely that plays such as Macbeth, Julius Caesar, The Tempest, Twelfth Night, and As You Like It would have been lost to us forever. The copy of the First Folio on display at the Morgan was the one originally given to the Bodleian Library at Oxford, England in 1623. However, just over forty years later, it left the Bodleian’s shelves for over two centuries. The Bodleian’s First Folio remained in private hands for many years after that and its whereabouts were unknown until 1905, when it suddenly popped up in the hands of an Oxford undergraduate who had taken it to the Bodleian Library to ask for advice about having it rebound. Once word got out about the recently discovered manuscript, an anonymous buyer offered the owners a bid of 3,000 pounds to purchase it (over $531,000 by 2014 standards). The owners offered the Bodleian the chance to match the offer, but lacking the funds to match such an extraordinary sum at the time, the Library decided to launch its first public fundraising campaign. Although Oxford graduates were approached about donating to the campaign, many of the donations came in the form of small sums from people with no connection to the Bodleian Library at all, both from the United Kingdom and from US. “It was… what you might call an early ‘Kickstarter’ campaign,” McQuillen said. Through these donations, the Bodleian was able to raise enough money to purchase back the book that had been lost to them for nearly 250 years. And the anonymous buyer who offered the initial astronomical sum? He was later revealed to be Henry Clay Folger, who would go on to found the Folger Shakespeare Library in Washington, DC, which houses the largest collection of First Folios in the world. Learn more on the Bodleian’s website. Sappho, fragments of poems. Graeco-Roman Egypt, second century AD. Credit: The Bodleian Library, Oxford. The seventh-century BCE Greek lyric poet, Sappho, was described in antiquity as “the Tenth Muse.” She is said to have written around nine books of poetry, but most of her work has been lost to time. 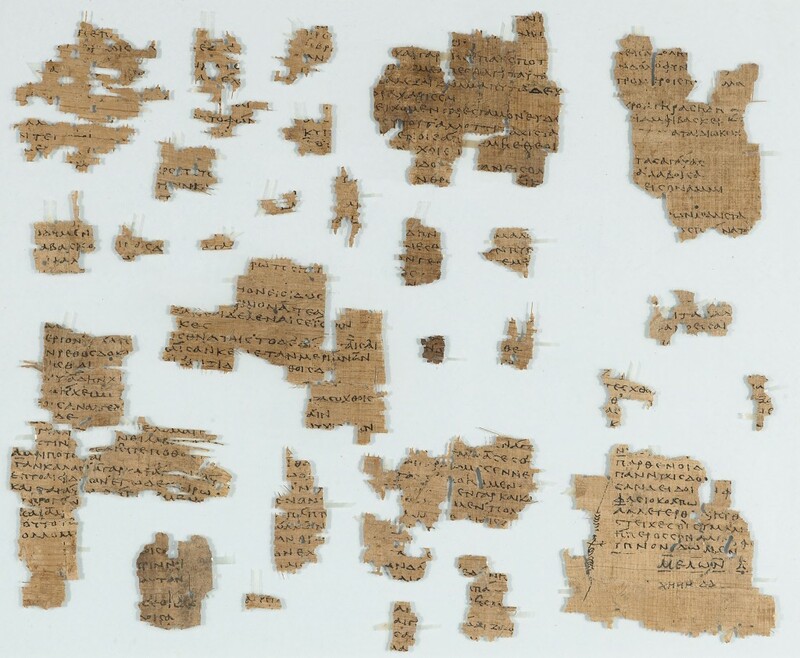 Though they were produced centuries after her death, these scraps of papyrus now on display at the “Marks of Genius” exhibition are some of the only known work of Sappho’s that remain — and they were found in a rather inauspicious location. Archaeologists in 1897 discovered them in an ancient trash heap near a small Arab village in Egypt. McQuillen suggests that the reason that the work of one of the most celebrated poets of her time should be discarded in such a fashion may be because the popularity of Sappho’s style of poetry had begun to falter. Whatever you desire with love in your heart. See more more on the Bodleian’s website, including audio of these lines recited in both English and Greek. During the time of the Roman Empire, the Greco-Egyptian geographer and astronomer, Ptolemy, wrote what would become the basis for all geographic knowledge throughout the Middle Ages and the early modern period. 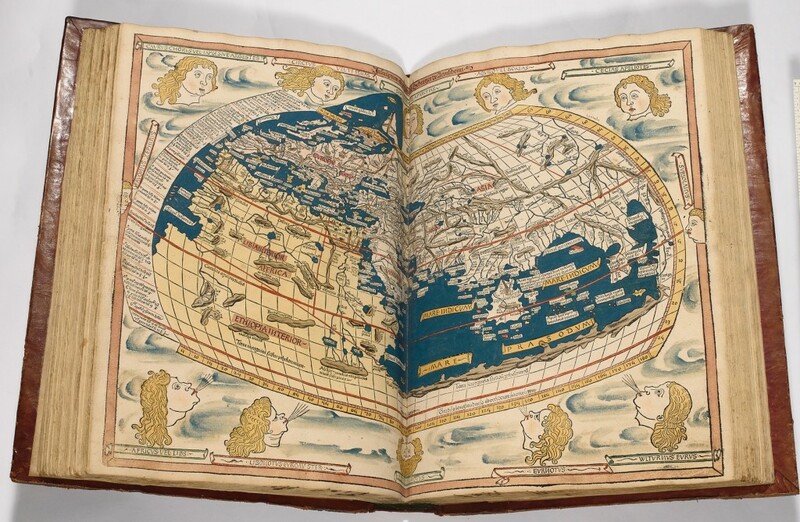 This map is part of a book published in Germany in 1486, and it illustrates Ptolemy’s calculations of what the world looked like. But of more fascination to some may be who once owned this particular copy of this book. It once made up part of the library of King Ferdinand and Queen Isabella of Spain, who funded Columbus’s 1492 expedition to the East Indies, which lead to the European discovery of the New World. Ferdinand and Isabella gave this book to the Venetian ambassador to Spain in 1495, but McQuillen suggests that before that, it may have had some influence on Columbus’s journey. Even though, from a modern standpoint, this map has become completely inaccurate (North and South America are missing and Africa’s southern tip disappears from the map, looping around back to Asia and thereby turning the Indian Ocean into a large lake), McQuillen said that it illustrates how new knowledge builds on top of findings and discoveries that came before it. For more works from the “Marks of Genius” exhibition that show how genius is inspired by its predecessors, visit the Bodleian Library here. As part of the associate producer "Dream Team" (as they refer to themselves) at NewsHour Weekend, Zachary Green produces and assists in the production of many of the segments featured on NewsHour Weekend. This includes shooting, writing, and editing such pieces as "No Comment" and "Digital Death". Before joining NewsHour, Zachary was an associate producer for Need to Know on PBS.